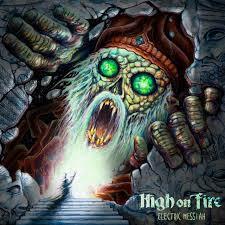 High On Fire pay tribute to the legendary Lemmy Kilmister with its aptly titled eighth record, Electric Messiah. The trio’s blend of Motorhead, Black Sabbath and Slayer is in full throttle throughout the record. “Spewn from the Earth” is a straight trasher replete with frontman Matt Pike’s guttural wails and ground shaking guitar riffs. Drummer Des Kensel’s manic double bass only heightens the song’s intensity. “Steps of the Ziggurat/House of Enlil” is one of two epic songs on this album that surpass nine minutes. A metallic take on the history of Sumeria, “Steps” is a towering piece of riffs that trudge forward, engulfing the listener’s ears. Things speed back up on the title track, which would do Lemmy proud. “Electric Messiah” is a blitzing take-no-prisoners assault of pummeling double bass and lighting palm muted riffs. This track offers little breathing room and forces you to bang your head. The way it should be. The second epic track, “Sanctioned Annihilation,” is composed of a driving triplet drum pattern underneath sludgey guitar riffs. This leads to a disjointed, yet cohesive tempo that is slow but mid-paced. There is little drag despite its 10 and a half minute duration, and it stands as the record’s centerpiece. Album closer “Drowning Dog” is a galloping psychedelic rocker that concludes the album in grand fashion. Electric Messiah rarely lets up throughout its 56 minute duration. This record pays homage to Lemmy in the best way: playing loud, fast and heavy. Matt Pike’s riffs attack from every angle while bassist Jeff Matz and drummer Kensel easily keep up. The record’s primary weak spot is “The Witch and the Christ” which lacks direction. Matt and company are at their best when they are dynamic and have an end goal. Luckily, this is only one misstep and the other eight tracks more than make up for it. The production is rugged yet clear, and one can hear the band’s pugnacious sound in all its glory. Matt certainly paid proper respect on Electric Messiah. A heavy, thrilling musical journey that will leave ears bleeding and necks hurting. Fans of the band should pick this up as well as folks new to the group. This is certainly worship music for the Church of Metal.